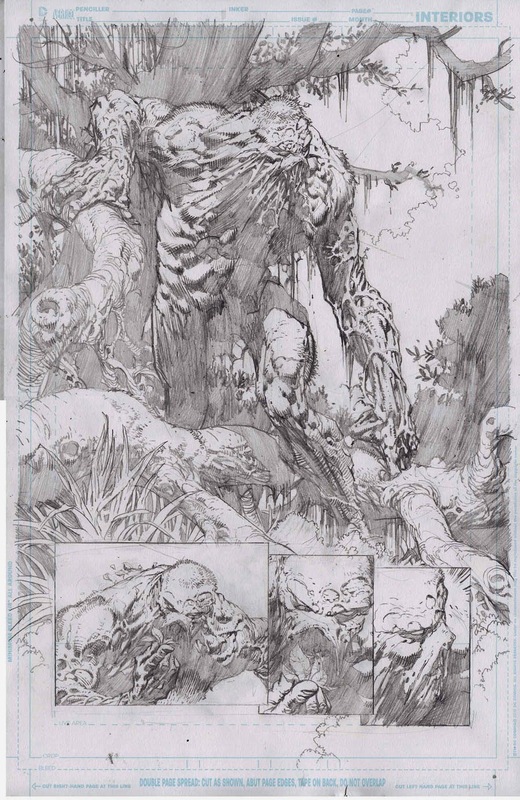 Swamp Thing has finished being the dumping ground of the DC52, that is if the first looks at the pencils for David Finch's Wonder Woman run are to be believed. One of the most unsung icons in the DC comics line, due to a landmark 80's run, mature readers imprint series at Vertigo and multimedia treatments, Swampy returned to the DCU in a pretty cheesy Captain Planet-esque manner, in the pages of Brightest Day. Despite following this by being one of the darkest and most beautiful looking books of the DC52 revamp, Alec went from towering success, raking in the green, to a pile of scrubland without marketing support, waiting for redevelopment and his time to come again, again. Now expansion plans have to be in the works at DC. Not only has Swamp Thing recently tackled the likes of Aquaman, his throwing down with Wonder Woman is part of artist David Finch's debut arc on the amazon (November's #36), hoping to replant Diana's roots firmly back within the DC mainstream, having run as a pretty self-contained comic in previous writer Brian Azzarello's hands. The natural way Finch's pencils render the bulk of DC's environmental mammoth, reminds me of the artists early issues of Batman: The Dark Knight, where Etrigan The Demon stole the show right out from under Bruce Wayne's cape and cowl, due to the very same talents. Hopefully in 2015, this kind of dark symmetry between artist and creation help encourage DC to step outside Gotham, but bring the city's artistic best to bare on characters such as The Spectre, Jason Blood and Doctor Fate, to help get these guys moving again. *sigh* I miss Alan Moore. Now THAT's what Swamp Thing should look like. You and I both King - you and I both. Glad you liked the pic too Random. Puts my scribbles to shame thats for sure! damn, the art work on that page is epic! Wow! Now why does his art look so much better here than during that whole Forever Evil mini? Someone put Finch on a ST short story quick!